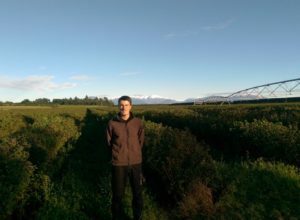 Johann Bullinger from Germany relates his experience as a seasonal worker in one of the biggest blackcurrant farms in New Zealand: the Tavendale farm. School is over – what now? When I graduated from high school in August 2017, I decided to spend some time abroad and work for a year, before starting my studies in university. At that time, I found it difficult to decide which direction I would like to take for my career. For this reason, I helped my uncle Michael Bullinger with his blackcurrant harvest after finishing school. (read our article on Michael Bullinger’s farm) In autumn, we worked on cuttings and plant propagation. This is what I had already done the years before: I had spent a lot of time at my uncle’s farm. I often worked with him on week-ends or during school holidays. I really appreciated this work, which I found very interesting and instructive. Of course, I knew that my uncle was involved in the International Blackcurrant Association and in touch with people from all over the world. This is how I came to ask him if he could help me with contacts from different blackcurrant farmers abroad. I wanted to ask them if I could work with them for half a year. The opportunity to travel to New Zealand was ultimately the most attractive. Firstly because the country itself offers unique landscapes and beautiful nature. 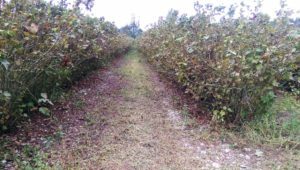 The second reason was that the harvest there takes place in late December – which I did not want to miss. My uncle met John and James Tavendale at the last Blackcurrant Conference in Ashford. Knowing them all now, I guess they certainly had a beer or two together there. He described them as being very friendly and kind people, whom I would certainly also like very much. 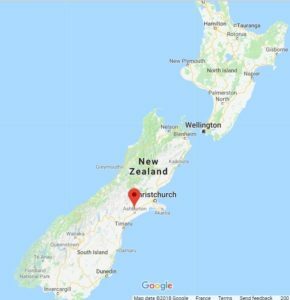 This is how I found myself on board of a plane on November 1st 2017, taking me from Frankfurt, Germany, to Auckland, New Zealand. On November 6th, James gave me a warm welcome on the Tavendale farm in Winchmore, a hundred kilometres South-West of Christchurch. The first thing that struck me was that every square meter of land on this farm is irrigated. Three irrigation techniques are used on the farm. The most modern among them is the pivot, which moves automatically from a fix pivot point in a circular movement across the field. In addition, the corners of the field are getting irrigated with permanently installed sprinklers. Other currant fields are getting completely irrigated with permanently installed sprinklers. As a third method, three waterguns are in use on the Tavendales’ blackcurrant fields. For us workers, this method is most time costly, because it is necessary to reconfigure and adjust them every day. However, they have the advantage of being more mobile and can be used in variable ways. The Tavendales’ blackcurrant fields are divided into three farms (father and two sons with their families). Each of the farms is located between State Highway 77 towards Methven and the Ashburton River. They all have a family house, a pump station and a weather station, and all are surrounded by blackcurrant fields. The Tavendales grow varieties like Magnus, Murchison, Melina, Blackadder, Kepler, Ben Rua, Ben Ard, Isobel and some hectares of redcurrants. They also produce organic blackcurrants of varieties Ben Alder, Ben Ard, Blackadder, Melina, Murchison, Reds, Hopkins and Hamilton. The duration of a blackcurrant field on the Tavendale farm is of roughly 15 years, some even 19. Whereas at my home in Germany, we harvest for 12 years. During this long lifetime, regular pruning is necessary. 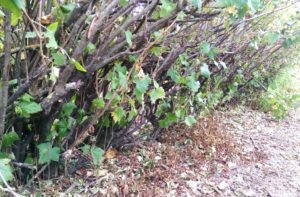 What also struck me was the height of the currant shrub. They grow up to 2.5 meters and their lower branches are therefore very thick. Furthermore, what also differs from my grandparents’ farm at home is that the blackcurrant cuttings are immediately planted at their final place. Whereas at home, we first plant them in a nursery close to each other in a row, and several rows forming blocks. Only when the shrubs are of about one meter’s height, we transplant them to their final place. In my opinion, the Tavendale Farm possesses a very fertile ground of high quality compared to the rest of New Zealand. In the greater part of New Zealand, agriculture is not really worthwhile because the soil has virtually no humus content and is extremely stony. This is also the reason why most of the farmers in New Zealand live on pastures and livestock farming. However, in the district of Canterbury, farmers use the better soil for agriculture. All in all, I cannot compare the soil structure with the very loamy soil at home in the Hohenlohe region. The harvesting process also differs significantly from home. My stay here in New Zealand is a very rich experience also for this reason: I have learned many new points of view and processing steps. 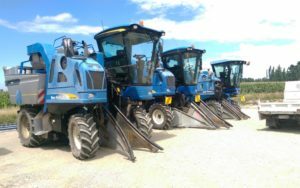 As an example, we harvest the currants with three harvesters: New Holland Braud SB58, 6060, 9060. It is an honour for me to be part of this three headed “Braud Gang”. After the harvest, we drive the currants from the field to the washing station with the help of four tip trucks. These have trays made of stainless steel. We dump the freshly harvested blackcurrants in a water bath. Branches and leaves now float on the surface and we can easily remove them with a washing drum. As for the submerged blackcurrants, they come back to the water surface on a conveyor belt. We then rinse them again with water jets. 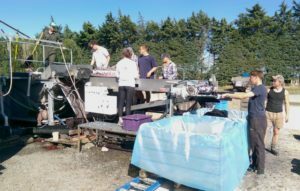 There are two helpers on the conveyor belt, who control the quality of the now washed currants, and remove the remaining small branches or leaves. 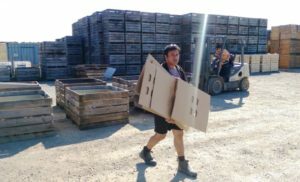 From there, the currants are packed in large crates and picked up by a truck. One large box contains 400kg of blackcurrants, and we deliver them to local juice companies. We keep another part of the blackcurrants in a big freezing warehouse. There are many birds in New Zealand, which is quite dangerous for the farmers here. The birds like to nest in very narrow and dark protected from wind and lay their eggs there. The engine compartments of tractors are ideal places! 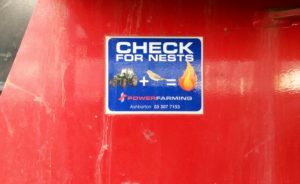 When we took out the Braud harvesters from their “hibernation” in December, we found 5 bird nests in the engine compartment of only one harvester. It was hard to believe how the birds managed to build their nest in such a narrow space. In any case, it is very dangerous to drive a tractor without first eliminating the bird nests. They build them with dry branches and grass and can therefore catch fire quickly. This is why I was taught that when I leave the tractor for a long time (for example for a week-end), I should leave the hood open. We can thus avoid that the birds settle in the engine compartment behind the protective, closed hood. 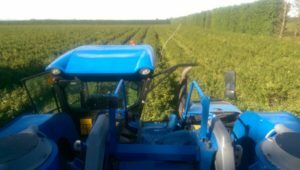 This year has been a difficult year for the blackcurrant market in New Zealand due to changes with the grower’s usual customers. Moreover, this year’s yield was not really awesome. 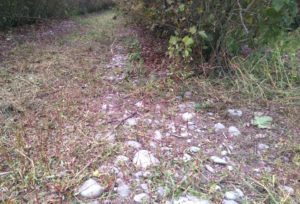 Due to various losses and frost in early November, it was somewhat disappointing. And finally, the blackcurrants were ripe as early as never before. While the harvest in previous years took place only in mid-January, this year’s harvest started just before Christmas. November 2017 brought only little rainfall – less than ever since meteorological records exist. In addition, the average temperature has been higher than it has been in 75 years. Nevertheless, in comparison with my uncle’s farm, it is a little easier to react to drought here. As mentioned earlier, a good irrigation of the fields is common standard – which is essential in such dry seasons.